Making A Purchase To purchase simply add any items that you wish to buy into the shopping cart. After you have finished your selection, click on ‘Checkout’ and you will be asked for a few details that we need to be able to complete the order. You will receive an auto respond message confirming your order. Postage Information Your order will be sent within 2 working days by NZ Post in NZ, or using International airmail worldwide. Shipping NZ$3 per order within NZ, or NZ$6 per order worldwide. Shipping is free when you order 3 or more. Shipping And Handling. Your order will be sent within 2 working days by NZ Post in NZ, or using International airmail worldwide. International delivery times are generally 7-14 days. When your order is ready for dispatch we will send you a further email confirming that your order is on it’s way. We do not charge for any item until it is ready to ship. Credit Card Security We accept Visa and Mastercard. When the order is placed at our website, credit card numbers are encrypted using 128 bit encryption. They are only decrypted after they reach the bank. Here at Canes Deer Products we do not even get to see your full credit card details, that is how secure the system is. They are not held in clear text on any web site, or in hard copy. If you prefer you may send your credit card information via phone, fax or regular post. We do not recommend sending credit card details by regular email. Manufactured from the complete antler (including the valuable tips), humanely removed at the optimum time for absolute maximum health benefits. Canes Deer Velvet is sterilised, processed and packaged under strict hygiene conditions in Government Licensed Premises meeting standards for Good Manufacturing Practice (GMP). The velvet is freeze dried to maintain nutrients in their optimum bioactive state, and milled extra finely to promote easy assimilation into the body. The manufacturing process of this supplement is 100% natural and the specified content and purity of our capsules is guaranteed. 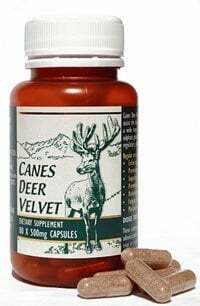 If for any reason you are not completely happy with your purchase of Canes Deer Velvet we invite you to return it to us along with your receipt, for a refund of the full purchase price. However please keep in mind that the benefits of Canes Deer Velvet become evident and increase over time. Some notice benefits within the first week. For others it may take 2-3 months to feel the benefits. This is when you can expect the body to have built up its nutrient levels enough for repair and healing to be taking place. Likewise the optimum dosage varies for everyone. Some get great results from 1 capsule daily, while others need more. If you have any questions on the use of Deer Velvet or the right dose for your situation please email our advisory service.